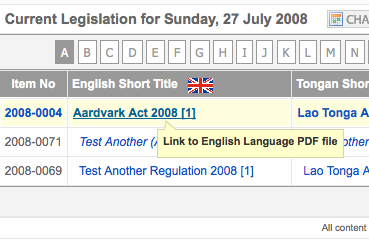 Select Legislation > Current > Alphabetical from the drop-down menu in the front-end of the web site. The window displays all CURRENT Principal, Subordinate and Amending legislation arranged in a Parent/Child relationship. Under Principal Legislation will appear Subordinate Legislation (indented) and Amending Legislation (indented and in italics). Under Subordinate Legislation will appear Amending Legislation (indented and in italics). Depending on SETTINGS in the back-end of the web site various rows may appear differently (see below for details). Row A - Is the INFORMATION row. It contains details of what is being presented in the window and a calendar (when the SETTING point-in-time is active) to allow the specific date for the viewing of legislation to be easily changed. Also at the far right of the window is a HELP icon. Clicking on the icon reveals this HELP screen. Row B - Is the FILTER row. It contains the A to Z buttons to logically group legislation alphabetically. NOTE: This row will only display when the SETTINGS A - Z display is active. Row C - Is the COLUMN HEADINGS row. It contains the column headings for the section D list. The row also contains the names and flags of the languages for the legislation being displayed. NOTE: The site is capable of showing one or two languages. When one language is chosen in the back-end SETTINGS, then the second language column will disappear. Row D - Is the LIST TABLE. It contains the list of legislation.Principal and Subordinate legislation contains a number at the end of the Short Title to indicate the version number (e.g. ).The version number will only display when the SETTING point-in-time is active. The row identifies the day displayed, allows the day to be changed, and provides assistance with the page. By clicking on the CHANGE DATE button in row A a graphical calendar will appear to allow the current display date to be changed. Clicking on the ? icon on the calendar will display additional details on the use of the calendar. Clicking on the << and >> icons will decrease or increase the month displayed by one year. Holding the mouse button down on the icons will display a range of years to choose from. Clicking on the < and > icons will decrease or increase the month displayed by one month. Holding the mouse button down on the icons will display a range of months to choose from. Clicking on any date in the current month will enter that date. Clicking on TODAY will enter today's date. Clicking in the top (where the month is displayed) or bottom panel (where the words 'select a date' appear) will allow the calendar to be dragged to another area on the screen. The position will be reset when the calendar is reopened. Clicking on a day name will make the day the starting day for the week. Clicking on the "X" will close the calendar. 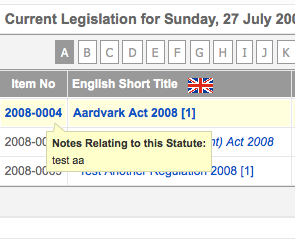 Click on a letter of the Alphabet (if available) to display the legislation for that letter. Click on the column heading to sort the list by that column's value (see figure below). The sorted row will show a direction (up or down) triangle next to the column name. Item No. Contains a number that will identify the item. Usually the number is related to the item itself (e.g. 2008-0004 is Act 4 of 2008). The format is YYYY-NNNN. The item numbers in section D can be hovered over to check the notes for the file. Items in BLUE have notes. Items in GREY do not. [main] Short Title. Contains the name assigned to the main language file. Clicking the Short Title text checks for the existence of the linked PDF file (see below). The Short Title is followed by the language flag. [second] Short Title. Contains the name assigned to the second language file. Clicking the Short Title text checks for the existence of the linked PDF file. The Short Title is followed by the language flag. NOTE: This column is only displayed if dual languages are selected via the back-end SETTINGS. Date Commenced. Contains the commencement date for the CURRENT files.